Trademarks are a form of Intellectual Property. The protection and defending of intellectual property is critical to the success of your business. Regardless of the size of a business, the name is the focal point of your products and/or services. It’s how customers come to know you and remember you. Protecting a business name ensures that when customers look for you, they find you and not your competitor with the same or similar name. A Trademark or service mark is a distinctive word, phrase, slogan, name, graphic symbol, picture, emblem, device, design, logo or any combination thereof which is used in commerce to identify and distinguish a company’s products or services from that of another company and to indicate the source of the goods or services. A service mark does the same thing as a trademark, but instead of products, service marks identify services and events. How do you acquire a Trademark or servicemark? Rights to a trademark can be acquired by either being the first to register the mark with the United States Patent and Trademark Office (USPTO), or by being the first to use the mark in commerce, which provides protection at the state level. However, to obtain the greatest protection for a mark for all States, it is usually advisable to register the mark federally with the USPTO. Can you lose your rights to a Trademark? 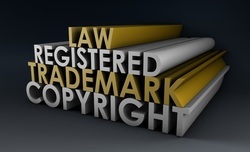 Trademark rights can be lost through improper licensing, assignment, genericity or abandonment. Trademark rights must be maintained through actual lawful use of the mark or rights to the mark will cease. In addition, if a mark’s registered owner(s) fail to enforce the registration in the event of infringement, it may also expose the registration to become liable for an application for removal from the register. What is needed to file a Trademark Application? 1) identification of the trademark; 2) list of wares and/or services (a single application may include wares and/or services of different classes ; 3) date of first use of the trademark in commerce or an intent to use the trademark in commerce; 4) name and address of applicant and name(s) of any predecessor(s)-in-title who used the mark; and 5) Drawings or specimens of the trademark. If you need help in protecting your products and/or services, please contact us to discuss your rights to protecting your name. We have and will continue to maintain a serious commitment to providing individual attention to each client about every aspect of his or her legal rights.